PEA Discomfort Relief is a unique chew-able supplement that relieves occasional minor pain. PEA (palmitoylethanolamide) is a compound naturally produced by your body. Now, we’ve packed 600 mg of PEA into a convenient, chew-able tablet. 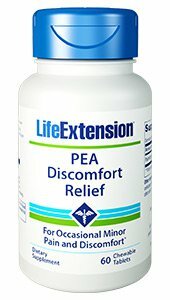 Live comfortably with PEA Discomfort Relief! An estimated 126 million U.S. adults report having experienced some kind of pain in the previous three months. That’s where PEA Discomfort Relief comes in: Palmitoylethanolamide is a unique fatty acid that can help inhibit discomfort. PEA’s efficacy has been demonstrated in multiple clinical trials. For example: In a controlled trial that randomised 636 patients to placebo or PEA for three weeks, 600 mg of PEA every day significantly improved scores on assessments of relative comfort and quality of life. PEA discomfort relief is a unique supplement that combines 600 mg of PEA in a convenient, berry-flavoured chew-able tablet. Chew one or two a day to relieve occasional minor pain and discomfort!